I have a list of movies that I'm planning to rip off or “pay homage to,” as Quentin Tarantino likes to call it. I started with You, the Living; the inspiration for a feature composed of vignettes that take place around Los Angeles. I’m also writing two screenplays that take place in one location: a big house. There are quite a few films that meet this criteria, but none as brilliant as Jean Renoir’s Rules of the Game, Thomas Vinterberg’s The Celebration, and Luis Buñuel’s The Exterminating Angel. In addition, Angel’s surreal elements are influencing the narrative of one of my more personal screenplays (see my protagonist's blog). In my eyes, there is no smarter and funnier filmmaker than Buñuel, and I only hope I can execute my stories with a small fraction of his humor and brains. Angel was a disappointment to Buñuel. After the success of Viridiana, he was given complete artistic freedom but not an adequate budget. In his memoir, My Last Sigh, he complained that "sometimes I regret having shot it in Mexico . I imagined it in Paris or London with European actors and certain luxury in the costumes and props. In Mexico, despite the beauty of the house where it was shot and my effort to select actors who didn't look particularly Mexican, there was a certain tawdriness in many of its aspects. We couldn't get any really fine table napkins, for instance, and the only one I could show on camera was borrowed from the makeup artist." 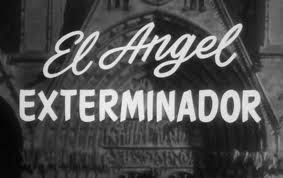 Buñuel was also unhappy with the completed version of Angel because it didn't go as far as he wanted. He felt he censored himself and if he were to remake it he "would leave the people locked up for a month, to the point where they would resort to cannibalism and fighting to the death, in order to show, perhaps, that aggression is innate." It's not a coincidence then, that while watching, I expected the narrative to go there and was surprised that it didn't. Ten years later Buñuel would get his chance to make a more expensive, polished and sophisticated film in France and with a cast of renowned European actors. The Discreet Charm of the Bourgeoisie - a study in frustration that slowly assumes cosmic proportions, as an ever-smiling group of society friends tromp from one place to another trying to have dinner - is considered Buñuel's ultimate statement on life's pervasive ironies; he presents a world in which even the simplest acts - fornicating or, supremely, eating - become exercises in futility. Both films share some of the situations and themes, particularly their contempt for the idle bourgeois and their values, unrelenting attack on organized religion and other targets and their unique mix of surrealism and black comedy. Although the fabulous Angel has been eclipsed by Academy Award winner Discreet Charm, Angel is arguably the more impactful film and definitely one of Buñuel's essential masterworks second only to L'Age d'or. 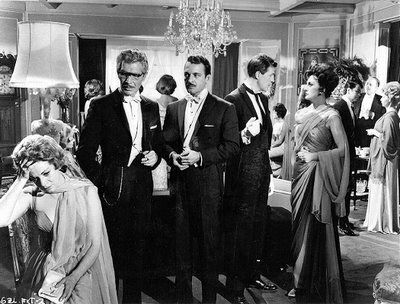 According to Buñuel, Angel is a chronicle of a shipwreck; a freakish dinner party in which a group of high-society friends find themselves unable to leave, trapped in a comic-existential nightmare of paralysis and descent into depravity over the days that follow. Buñuel taunts his characters and the fascinatingly sadistic relationship between creator and creation is evoked explicitly in devilish pieces of dialogue ("This is a bit excessive!") as well as in the twisted pleasure some of the characters derive from their helplessness. "I adore things which go out of the ordinary," a woman says before things really start going very wrong. Buñuel subverts from within, introducing contradictory images and phrases that open holes in the narrative rather than shattering it outright. The characters deteriorate mentally, physically and socially at an alarming rate. The events, including the psychotic mind tricks, are presented matter-of-factly and no attempt is made to explain why the guests prove incapable of leaving the parlor room. A character dies and is crammed into the same cupboard as the suicidal lovers. Incestuous siblings steal morphine from a terminally ill companion. A woman goes into a trance and begins summoning demons. They urinate in antique urns, they eat the sheep driven into the room by a bear, they crack through a plaster wall and burst a water pipe so they can at long last get something to drink, and in an unforgettable creepy scene, a crawling hand slowly makes its way to the neck of a woman almost out of her mind with hunger. Gradually, their religious beliefs give way to pagan rituals, their elaborate evening clothes become more ragged and dirty, and their snooty self-importance melts away into a savagery they would have previously thought for themselves impossible. The guests perform meaningless, Sisyphean rituals dictated by their privileged class: the repetitive introductions, the polite acceptance of social invitations, and the perpetuation of self-indulgent dinner parties. However, it is also the passive comfort of their social status that creates their claustrophobic isolation and complacent inertia. Stripped of their pretense, their innate behavior remains fundamentally instinctual, base, and primal. Buñuel's intent is clearly to erode the veneer of civility that keeps the bourgeoisie from imploding and show how the very status, etiquette and ritual upon which their complacent privilege rests isolates them from the remainder of society and reduces them to inertia. But he's also keen to reveal both the bestial instincts that lurk beneath their smug sophistication and their inability to learn from their experiences, as the action closes with the survivors being unable to leave the local cathedral, while a riot erupts outside. Even after they've managed to lead themselves out of the house, Buñuel imprisons them once again, only this time inside a Catholic church after morning mass, giving them what he feels is the only thing they deserve. If you are new to Buñuel films, this may seen very weird. It is, but that's just the beginning. It's also incredibly entertaining, provocative and funny. 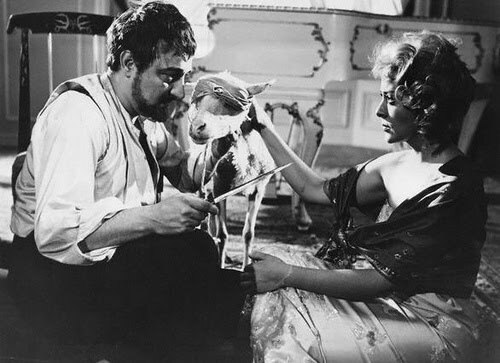 Buñuel grinds his ax with the utmost relish and a heavy dose of sarcasm. He pokes fun at the elite with great bravura and wit, ripping them to shreds. It becomes wildly apparent in Angel's first moments that no one and nothing is sacred. Buñuel wages nothing less than dramatic all out war against the pomposity of the ruling class and its dependency on the lower class. He points out a country's fundamental failure to recognize just how much societal order hinges on the work of the proletariat. The director started with a screenplay, but also improvised as he went along, embellishing the basic situation with stylistic decisions such as the use of repetition, a circular narrative structure and autobiographical details. He photographed the film in a way that keeps our eyes yearning for exposition, causing our glances to dart every which way about the room for any extra clues regarding the mystery. 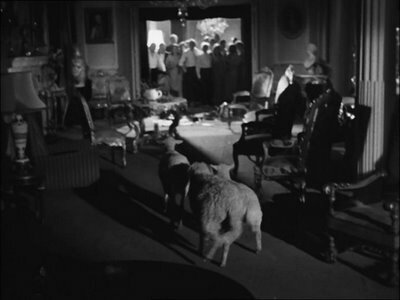 Angel is full of surrealist disjunctions and insouciance; famously, the beginning is repeated exactly, one of a number of repetitions throughout the film, and sheep crowd into a church as the ending starts the story all over again. Sheep share boundless significance, painkillers become a symbolic commodity, and even the ravings of an elderly, dying man serve as a bold foreshadowing mechanism that only completely reveals itself much later on. He claims that he's glad he won't witness the "extermination," which instantly makes us think the title and the situation, and size up both for cinematic puzzle-solving. Buñuel's sardonic humor and surrealist imagery are instruments of social indictment and all of Angel's cinematic elements seamlessly come together to focus on Buñuel's core material. In a culture defined by etiquette instead of humanity, Buñuel exposes the underlying artifice and hypocrisy of civilized society. Interpreting Buñuel's stories as a system of "ideas," as merely intellectually articulated attacks against church, class, and state, is completely off the mark. Buñuel's movies are not manifestos; they don't function on an intellectual level as Godard's cinema does, but at a more subliminal, and, thus, more deeply affecting one. "I don't have ideas," Buñuel once stated in an interview for the French television show. "It's all instinct." Nevertheless, Buñuel delighted in confounding those who tried to find meaning in Angel. For one scene, Buñuel said, "It suddenly occurred to me that Silvia (Pinal) should tie a blindfold around the sheep's eyes and hand Nobile (Enrique Rambal) the dagger. And that was that. Completely improvised, without any thought to whether anything was symbolic. A good symbol of nothing. Despite this, several critics gave various interpretations of the scene. The sheep represented Christianity, the knife, blasphemy...I intended none of that, everything was arbitrary. I only tried to evoke some sort of disturbing image." Some argue that Buñuel despised human beings. The wisdom and humor at play in Angel indicate quite the opposite. In spite of all their despicable yearnings, his characters all aspire to high ideals. That they are ultimately defeated individuals or, worse yet, hypocrites, gives his humanism its bitter kick and eternal complexity. Angel is a microcosm of Buñuel's contradictory universe of the beautiful and the grotesque. Buñuel executes Angel with pitch-perfect tone through delicately-scattered surrealist images and a topnotch script. He crafts his ambitious-yet-simple film into a meditative parable, one chock full of cunning imagery that ties together a wide gradient of beliefs and impressions. It's straightforward in design, but it's as complex and thematically rich as the viewer wills it to be. Angel is a mesmerizing, richly symbolic, allegorical tale on the nature of human behavior: of masters and servants, of excess and want, and of fraternity and alienation. It's endlessly fascinating due to its labyrinthine concepts. The result is an astoundingly complete mystery that will linger with you for days, one that somehow brings spiritual and societal concepts together for a mammoth of a thought-provoking masterpiece that sparks actual desire to partake in the material many times over.